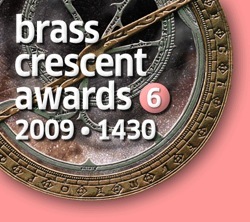 The 6th Annual Brass Crescent Awards are open for voting. There are some really impressive writers that are on the list. I was actually surprised to see my blog nominated, especially since I haven’t been posting much. But I am not surprised to see my husband’s blog nominated for Best Design and Best Writing. He has done some great work for the Philadelphia community and his writing, masha’Allah, reflects his intellectual and community endeavors. I think some of his finest work is on the Ma’rifah blog. This year is also bittersweet because we now have a category for best retired blog. There are some writers who I dearly miss, but I hope one day that their thoughts will find some place in history on a dusty book shelf somewhere. I say that because I am fond of bookshelves. On another note, outside the major slide into fitnah and backbiting that we experienced last year, there has been some positive developments in the blogosphere. With sites such as MuslimMatters and Muslimah Media Watch, we have some great collaborative work. When you combine their resources with the likes of Suhaib Webb’s blog and numerous others, the future of blogistan looks pretty bright. It really humbles me to be included among these heavy hitters. I hope that one day I can rise to the occasion and someday prove worthy of such high consideration. Your husband, Marc, is THE man! I have to seriously disagree with you on that point. From Umar Lee’s sporadic postings ,Tariq Nelson’s complete disappearance to the many Muslim blogs that have gone by the side. The future for Muslim blogs is pretty bleak from where I stand. The Muslim blogosphere will continue no doubt. However it will never be as it was. Change is the nature of this world so I guess I have to live with it. Hamza, I understand the basis of your opinion. I too have noted the decline of personal blogs. I think one of the reasons why Tariq may have discontinued his blog is that he likely said much of what he had to say. When those “under-the-rug issues were aired out and became part of the discourse in the various masajid, he achieved his purpose. Umar obviously has his hands full. Other bloggers who drew a lot of attention also addressed similar issues. Some addressed them in a way that bordered on slander. Others aired their beef on the blogosphere, and where was the positivity in that? There are a few who are sensationalists with a number of a personal, unqualified opinions that pique the attention of our most credulous readers. I argue that journalistic, scholarly, and intellectual blogs are promising. Blogs like Suhaib Webb’s and Seeker’s Guidance offer educational resources, as well as thought provoking pieces. Muslimah Matters is a great reference site and the writers offer quality op-ed pieces on media portrayals of Muslim women. They have raised the standard for online writing: they increase knowledge (not just bolster our already pre-set conclusions), they call for productive action, and they have higher standards for the writing they produce. Plus there is the new crop of writers who are beginning to address many issues that some of us old heads aren’t aware of. I am encouraging my students to blog, so that they too may find their voice. At the same time, I hope that we push beyond the solipsistic musings of lonely bloggers who write about the minutia of their lives or the Muslim “B” list celebrities who just want the limelight. We have a right to disagree, but I do hope you understand where I am coming from. I have to agree I love reading your blog and thoughts. I read The Ma’rifa Blog and listen to the podcasts on my IPOD. The breadth of Brother Marc’s writing is always engaging and challenging. There is some wonderful thinking (Masha’Allah) going on here.